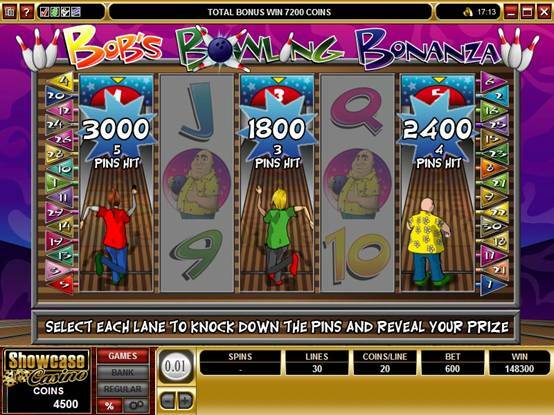 Bob’s Bowling Bonanza is a 5 Reel game, based on a Comic Bowling theme with a Perfect Game Feature. This is a 5 Reel, 30 Payline Video Slot, with an on screen feature as well as a Gamble Feature. 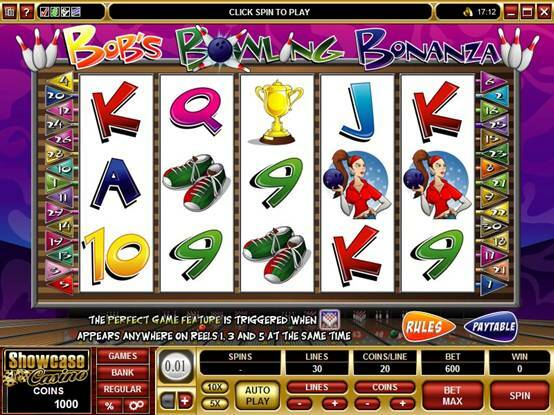 With a hundred million players in ninety countries around the planet, ten pin bowling is an internationally popular sport which Riverbelle Online Casino acknowledges in its latest video slot release this month, Bob's Bowling Bonanza. With a big 5 reel, 30 pay-line structure that includes reels morphing into bowling lanes, this game will generate hours of fun and the chance of some generous rewards. 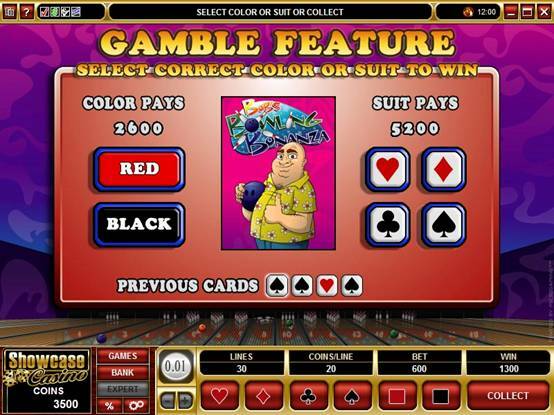 The theme is amusingly created by colorful, quality cartoon graphics featuring Bowling Bob and his babe Babs, along with trophies, bowling shoes, pins and balls, all supporting a big, entertaining game with Wild, Scatter, Bonus Game, Expanding Reel and Gamble features to keep the action fast and furious. The Perfect Game is an important feature of the game, triggered when the Strike symbol appears simultaneously anywhere on reels 1, 3 and 5. When triggered, the reels morph into bowling lanes, where the player delivers a virtual ball toward the serried pins - the number of pins knocked down is multiplied by the triggering bet with the possibility of winning up to 20x per lane and 3 full strikes means the perfect game! Another winning symbol is the bowling ball itself, which acts as the Scatter helping the player to create winning combinations. The Strike is Wild and substitutes for all symbols - a major advantage in building winning lines. 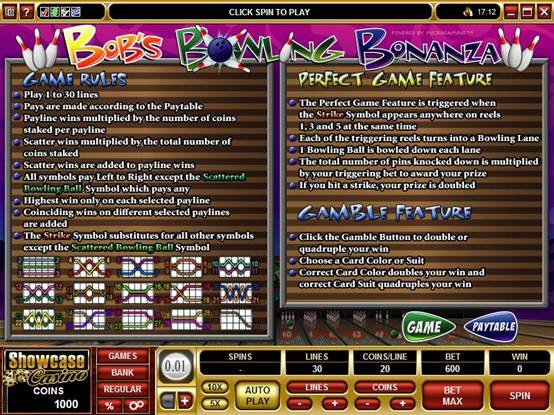 Riverbelle Online Casino’s popular Gamble opportunity has been included in Bob's Bowling Bonanza, giving the player the option to double or quadruple winnings by guessing the right color and suit presented in the game. 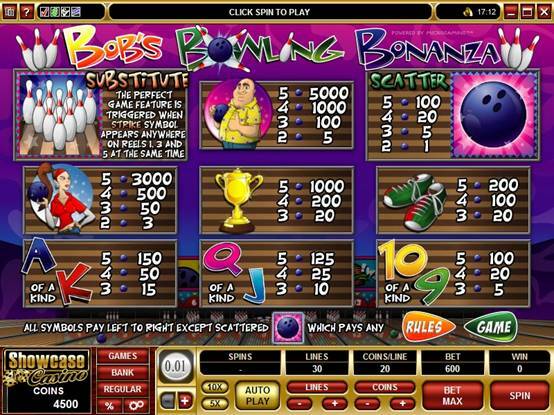 Bob's Bowling Bonanza combines two very enjoyable pastimes - ten pin bowling and Internet gambling - to deliver hours of entertainment and the exciting prospect of really good rewards – so slip on those bowling shoes and try it out at Riverbelle Online Casino now!